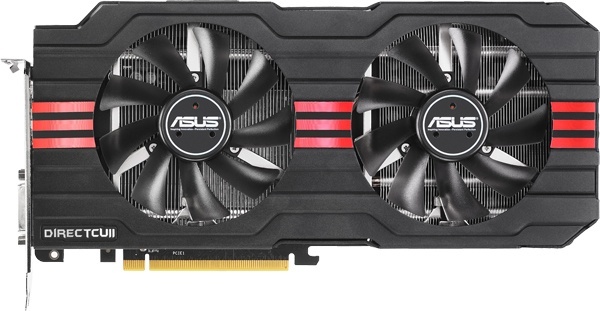 ASUS, The leading hardware manufacturer today announced the second revision of its Radeon HD 7950 DirectCU II graphics card which comes with an updated cooling and PCB design. Reports of this specific model came around two months ago which you can see here. 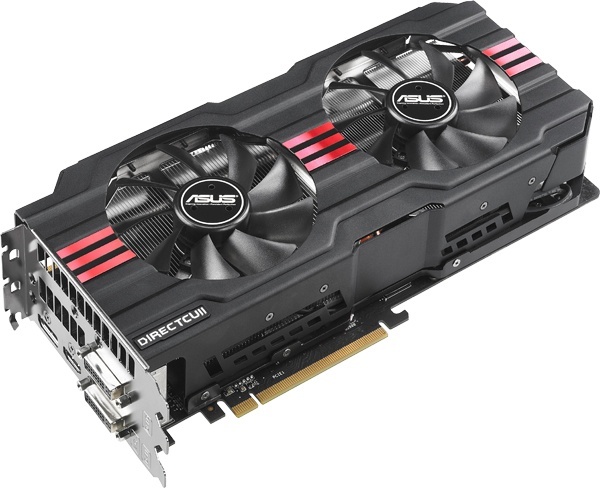 The ASUS HD7950-DC2-3GD5-V2 comes with a DIGI+ VRM design and includes Super Alloy Power technology, featuring a special alloy formula used in power delivery components such as capacitors, chokes and MOSFETs. It instantly lowers average operating temperatures up to 35°C, extends product lifespan 2.5 times, and improves overall performance up to 15%. This gives users access to greater overclocking potential, as the HD 7950DCII V2 can withstand higher operating temperatures than its reference counterparts. For more details head over to product page here. Was also included in the video card, he has been acclaimed as a power supply circuit for the digital motherboard power supply circuit “DIGI + VRM”. We have achieved high stability by supplying precisely instantaneously, the required power of the GPU that changes in real time by the load conditions. Has become a feature also has been reduced up to 30% of current noise compared with the circuit of the common power supply for the video card, I have to improve the stability of the load and high stability when overclocking, especially. By using the original material formulated proprietary material of various components installed on your video card, as well as to achieve better stability and component life, Super Alloy Power is a high of ASUS original was able to increase the resistance overclocking This durable high-performance components. Choke coil (Super Alloy Choke) is realized by manufacturing the highest low temperature of 35 ℃ high density in addition to the use of the original material. Capacitors (Super Alloy Capacitor) is to realize the long-life of up to 2.5 times. MOSFET (Super Alloy MOS), the corresponding voltage is 30% larger. Capacitors for GPU (SAP CAP) is to achieve stability when overclocking up to 28%. Figures to improve the performance of each component is a numeric value when compared to the reference design of the GPU manufacturer. Has been greatly improved heat transfer efficiency by making contact with the surface of the heat pipe GPU, DirectCU II cooler is a cooler for your video card ASUS original. In the cooler typical heat the GPU is transmitted to the heat pipe through the base once, since the heat of the GPU is transmitted to the heat pipe directly, the DirectCU II cooler is able to remove heat from the GPU efficiently very you. Moreover, the adoption of the dual fan air can be sent evenly to a large radiating fin, a cooler for the video card is to achieve a powerful cooling performance and silent operation at the highest level. 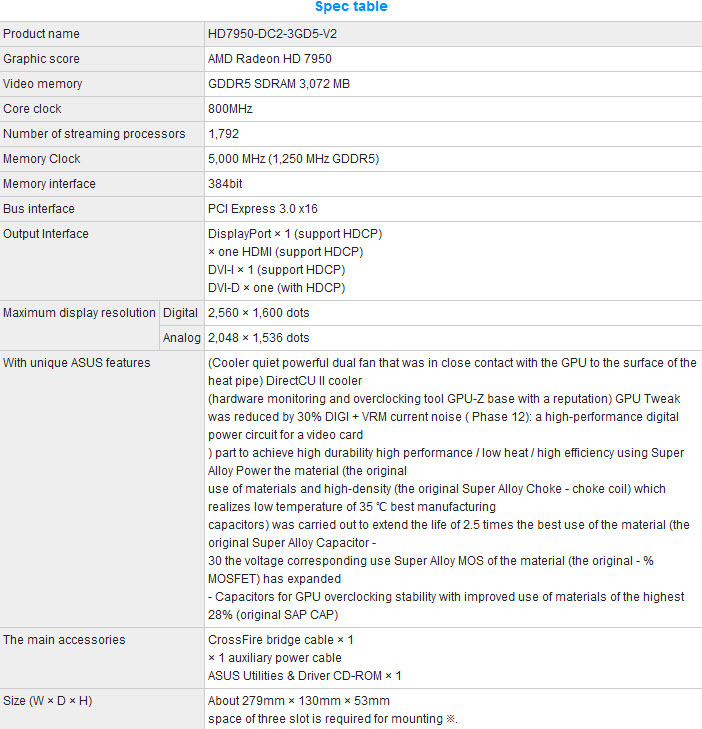 “GPU Tweak” is a high-performance configuration software settings and overclocking features hardware monitoring function.With this software, you can check the status of the video card from the top finely Windows. 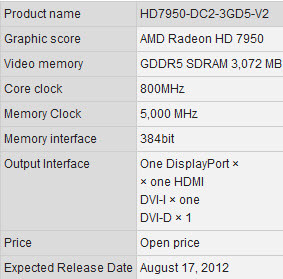 It is also possible to individually set overclocking details. GPU Tweak is a high-performance software has been developed based on well-established collaboration with techPowerUp as hardware monitoring software for your video card, the “GPU-Z” on techPowerUp. It has been a while software is multifunctional software which allows you to configure settings very detailed, very easy to use as well as the GPU-Z.